Japanese wineberries (Rubus phoenicolasius) are a relative of raspberries and brambles. They are as easy to grow as raspberries and it’s surprising that they aren’t more common in the UK. There are a number of reasons why you might want to grow them. One is that they fruit in early autumn, nicely filling the gap between summer and autumn raspberries, but they are also worthwhile in their own right, different from either rasps or blackberries. They certainly look different. The stems of Japanese wineberries are covered in red glandular hairs which give them a red, furry look (and their Latin name – phoenico means red) and an odd, somewhat sticky, somewhat waxy feel. You sometimes see insects stuck to the glands, making the plant look a little carniverous, but apparently it gains nothing nutritionally from these catches: presumably the motivation is more to do with pest control. The hairs extend onto the calyces which enclose the young fruit; as the fruit ripens the calyces slowly peel open to reveal it. The ripe fruit is a design classic. About the size of a wild raspberry, the berries are wine red and share a little in the stickiness of the canes. The taste is sweet and pleasant. The big drawback to growing wineberries at my latitude is that not all plants offered for sale in the UK seem to thrive here. I first came across Japanese wineberry myself at the Plants for a Future site down in Cornwall and it quickly made my list of plants to acquire. Unfortunately, a succession of plants bought from nurseries in the south of England either perished over winter or grimly clung to life but never produced any fruit. Eventually I decided that it wasn’t suitable for the north of Scotland. Then a friend told me about a self-seeding population at Crathes Castle in Deeside. She obtained a seedling for me and it quickly grew into a hearty, vigorous bush that has now seen off several winters. This underlines the importance of local varieties and trying to get hold of local provenances. Japanese wineberries like to grow in full sun. They are mostly immune to raspberry diseases but mine has poor ventilation due to a tall fence built by a neighbour and the racemes or flower heads have a tendency to rot in wet weather. From what I have seen of other plants moving it should fix this. Like most Rubus plants the stems are biennial although the plant as a whole is perennial. The fruit is borne on the second-year canes (floricanes), which should be pruned out at the end of the season. In growth habit they are somewhere between raspberries and brambles. Like brambles, the canes form a dense clump from a single point, so they need to be trained along wires or tied loosely to a stake at the centre of the clump. Fortunately they don’t spread as aggressively as brambles, but they do share their ability to root at the tips if they touch the ground: a characteristic that can be used to propagate from a superior plant. 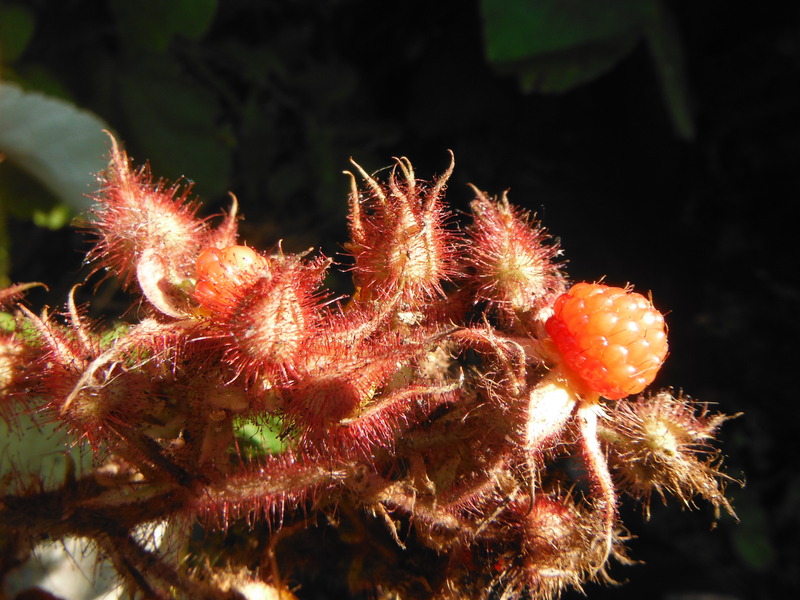 This entry was posted in Plant breeding, Species and tagged Japanese wineberry, local vareties, Rubus phoenicolasius. Bookmark the permalink. Our wineberry seems to be thriving in fairly poor soil by the gate, though we give it a bucket of compost every now and again. It gave us a nice little crop this year, but they are tiny. We found the very best use for them was to allow children to pick them for immediate consumption – the lovely shine they have seemed to encourage illicit picking, so it was the next logical step and kept a number of children interested over several sessions. Ours is now 3 and about 1m in height and width – I’d be interested to know how that compares to yours? We started with a single stem that had layered naturally. The canes on mine are about 1.5m long – height and spread depends on support. I agree they’re a good one for immediate eating. We grow ours from seed so they are grown very hardy. Had good reports of fruiting, and especially from people in the Clyde Valley. But made the mistake personally of planting the canes in a very shady (not to say dense undergrowthy type of spot – typical of my garden!) and though we got fruit the first year on canes about 1.2m they refused to grow the second year. Will replant following jungle clearance in a better situation! Got lots for sale. I’ve added that to the body of the article. Your blog is excellent. Keep it up. I read for the good writing and unique perspective. I live in new York city so your work doesn’t apply perfectly to my region I think, but I may still learn something applicable. Hi Deidra. Thanks. New York City certainly wasn’t what I was picturing while writing the posts, but I hope some of the information is useful all the same.